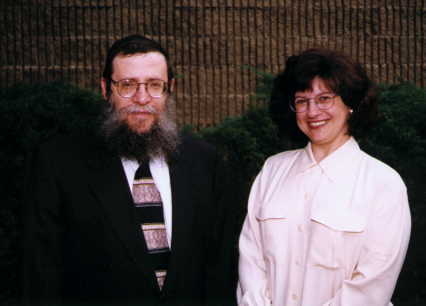 Rabbi Noson and Miriam Gurary. Rabbi Noson Gurary received his rabbinical ordination and later - his ordination for Dayonus in the famous yeshivah 770. He married to Miriam Hendel in 1968 and after that spent another 2 years in the Collel. In 1970 he volunteered to go on shlichus and wrote to the Rebbe for a blessing. Then he contacted the head office of Merkoz Shluchim. The first opportunity was in Finland, then - in Greece, but neither one worked out. Then there was given suggestion to go to the University at Buffalo, where there were thousands of Jewish students from New-York - Long Island area. This was the time of Vietnam war, heights of the hippy generation, and the campus of UB was a hot place for all kinds of missionaries. The Rebbe's office received request from the Jews of Buffalo to send somebody to work with the Jewish students. Says rabbi Gurary: "I had no experience at all with students, especially radical ones at the peak of hippy movement, and yet I had willingness to go wherever the Rebbe would want me to go. I was not at any way coherced or drafted to go there. As with thousands of Lubavicher Chassidim, my whole goal in life is to share whatever knowledge I have with fellow Jews, my greatest priviledge is bring delight and happiness to the Rebbe. I was not sent only for the students, but for the whole Jewish community of the western New York. Eventually I brought other shluchim to the area and paid their salaries for 2 years in order to open Chabad centers in Rochester, Syracuse, Binghampton and Ithaca". As the Executive Director, Rabbi Gurary is involved in every program of Chabad in Buffalo. He is teaching courses in the University at Buffalo and in the Law School, writes and publishes books in the area of Jewish misticism and Chassidic philosophy, conducts Lunch & Learn programs, personally runs Chabad House on Shabbos and Holidays, constantly councels on all levels. He is also involved in international projects, particularly reaching Jews in Russia.